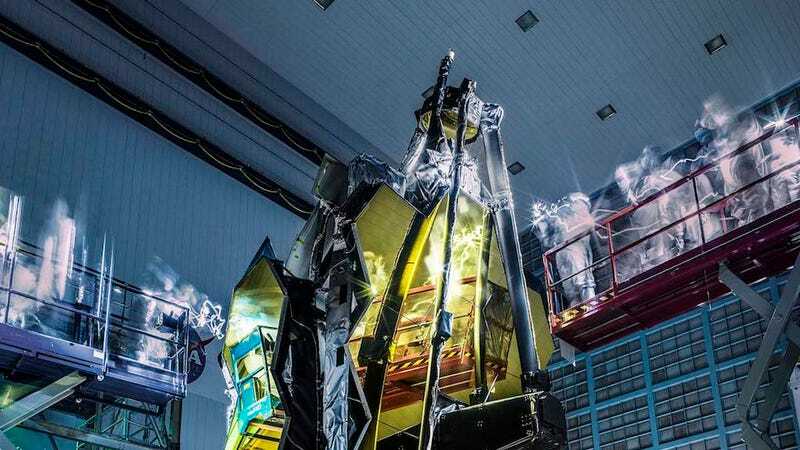 One of the most powerful telescopes ever built—NASA’s James Webb Space Telescope—is set to make its big debut in 2018. But before it starts scouring distant galaxies, or searching for life around at TRAPPIST-1, the telescope must undergo quite a bit of testing. Apparently, during “lights out inspections,” James Webb gets a little creepy. On March 15th, NASA posted a spooktacular image of the telescope in the agency’s Goddard Space Flight Center in Greenbelt, Maryland. While the figures in the picture are pretty ghoulish, they’re actually just technicians performing vibration and acoustic testing, which is used by engineers to ensure that everything stays where it should during the turbulent rocket ride up into space. According to NASA, the contamination control engineer used an ultraviolet flashlight to look for contamination after the vibration test, which set the mood lighting for the spooky shot. “The people have a ghostly appearance because it’s a long exposure,” NASA photographer Chris Gunn said. Since the camera’s shutter was open for a long period of time, it captured the technicians’ movements, making them look like ghosts. This spring, NASA will ship the James Webb from Goddard to the Johnson Space Center in Texas, where it’ll undergo further testing. Eventually, the assembled telescope will be shipped to French Guiana, where it’s scheduled to launch next October aboard an Ariane 5 rocket. Considering that October is the spookiest month of the year, this is hardly a coincidence.